A Red Rocks show which became not only a watershed moment in U2's career, but also a piece of rock history. Once upon a time, like any other band, U2 were young and hungry. Before the massive stage shows, the Fly persona, and meetings with world leaders, Bono and company were touring America, growing their fan base with electric live shows. Years before they started dressing like dust bowl farmers for The Joshua Tree, they were actually seeing America, unlike many of their overseas peers who refused to commit to the slog of a US tour. Even before they exhibited a talent for reinvention, they obviously knew how to seize a moment. Case in point: their June 5, 1983 performance at Colorado's open-air Red Rocks Amphitheatre. It was a performance that many bands, in the face of torrential downpours, would have cancelled before it even started (the show's promoter was all for killing the show, but was stuck on a plane while that decision was made). Instead, U2 booked a rain-check show in Boulder for the next evening (for the fans who didn't want to brave the elements at Red Rocks), and proceeded with the Red Rocks show as planned. A rabid crowd (which filled only about half the venue) witnessed a Red Rocks show which became not only a watershed moment in U2's career, but also a piece of rock history. Nestled into a natural stone formation in Red Rocks Park, the amphitheatre is a stunning sight even when empty. But on the night of U2's performance, as rain gave way to a mist that seemed like it was trucked in from an Irish heath, and as darkness fell, the venue certainly didn't feel like the American Southwest. It's rare that a band can totally transform a scene -- especially one with a stage show that boasts charisma as its only special effect -- but it's not hyperbole to say that U2 put on a dominating, flawless-despite-mistakes performance. This is the one that put U2 on the map. It didn't hurt that MTV latched onto the band's Red Rocks clips. Apart from the occasional professionally shot video (such as the loose rebels-in-the-snow narrative of "New Year's Day"), many fans' first glimpse of U2 was the sight of Bono, with his breath pluming in the cold air, erecting a white flag at the lip of the Red Rocks stage and exhorting the crowd to yell, "No More!". Before he claimed the Live Aid stage as his own before an international audience, Bono's charisma was on full display in the Red Rocks videos, even if his stage mannerisms still needed some work. Geographically/historically clueless American teens, many of whom had no idea what "Sunday, Bloody Sunday" was about (I even had a friend sniff, "Why don't you just listen to 'Sabbath, Bloody Sabbath'? It's the same thing. "), but knew that it was different, and powerful, and cool. Even though it covers only their first three albums, Live at Red Rocks remains U2's definitive live statement. Available for years on VHS, the performance finally makes its way to DVD. Adding five songs, it's the complete show -- for the most part. Anthony De Curtis' informative liner notes reveal that "I Fall Down", for example, suffered from a camera malfunction -- it's the only song missing. What will be more irritating to diehard fans, though, is the loss of two moments from the show: the "Let's Twist Again" snippet in "Two Hearts Beat as One" and the "Send in the Clowns" portion of "The Electric Co.". To be honest, Bono's inclusion of "Let's Twist Again" hardly elevated "Two Hearts Beat as One" to special heights. In the case of "The Electric Co.", however, we're left with a long stretch of footage that shows the band playing with Bono nowhere to be seen (or heard). In the cut footage, he's on the lip of a side stage, flag in his hands, silhouetted against the twilight as he sings to the crowd. Presumably, licensing issues kept that footage from being used, which is a shame. What's included, though, is top-notch, even if the footage's roots in video rather than film stock occasionally rears its head. The band's performance doesn't flag for a moment, with many renditions easily outshining their studio counterparts. The band's performance of "Sunday Bloody Sunday" even benefits from the happy coincidence of being played just as night falls and as large braziers of flame alight at the top of the Red Rocks structure. At that moment, the band could be playing in the middle of an apocalyptic landscape, or war-torn streets. It's a perfect marriage of subject matter and visuals. 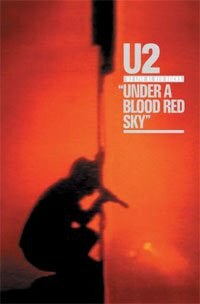 The performance comes as a standalone DVD, or as a companion to the Deluxe Edition of the band's live EP from the same time, Under a Blood Red Sky, with no real bonus features to speak of. It's a shame that Under a Blood Red Sky didn't get the same expanded treatment as Live at Red Rocks. Despite the fact that the EP is actually culled from several different performances (with only two songs coming from the Red Rocks performance), it's always been considered a companion volume to Live at Red Rocks. Live at Red Rocks is a vital, live document on its own merits, and on the merits of the performance it captures. But it also acts as a something of an antidote to the band's irony- and persona-dominated later work, where flashes of U2's old fire sometimes seem like calculated, halfhearted sops to fans. It's useful to remember that, once upon a time, U2 were hungry and young, and they earned their status as one of the world's biggest and best bands.